Top Places to Eat in Blackfoot! A great place in between the bigger “cities” of Idaho Falls, where I work for the Group Real Estate, and Pocatello is Blackfoot, Idaho. A smaller town just off the freeway, Interstate 15, you have quite a few places to eat. If you are on a long trip from Utah, or to Utah, this is one of the better places to stop and grab some grub. Here are a few places to contemplate putting into your Google Maps as you drive past the Exits for Blackfoot. 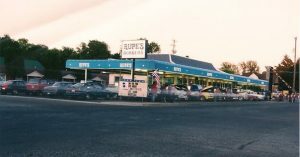 The best place in all of Blackfoot to stop is Rupes burgers. The atmosphere here is extremely inviting. You will enter a place that has posters and rugs from the local teams, from Pocatello to Firth to Shelley. As you sit down, it’s a great environment for families, very inviting, as you simply grab the menu and wait for the waiter, or waitress, to come take your order. The burgers are on point, the tater tots are great, and their dessert menu is to die for. The other great part, if you are quick and need an on-the-go, it has “old timey” style drive-in drive ups, like a Sonic. You have the ability to get your food on the go, by parking in the slots designated for the cars. A very authentic atmosphere that has amazing comfort food. Just like Shelley, there is a Mr Pizza here. Also cooked in a brick over and hand tossed. This one features dessert pizza, as well, unlike the one in Shelley. An updated atmosphere from the Shelley sister company, you still get a wonderful place to sit down and eat your pizza and the cheesy bread sticks are still a main staple. Just off the main exit for Blackfoot is, maybe, the best place as a sit down restaurant in all of Blackfoot. The Homestead. If you love home cooked food and you want that home feeling comfort, this is the place to stop. They serve everything from breakfast foods to dinner entrees. They are especially known for their soups, pies and chicken fried steaks. The service is great and the staff is very friendly. 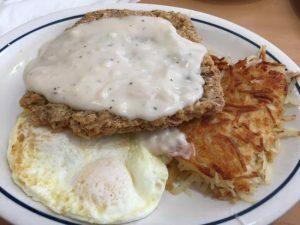 If you love country style food and cooking, make sure to stop in for a country fried steak. 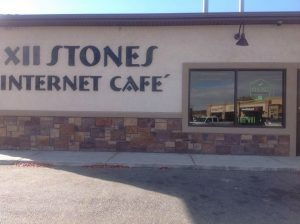 XII Stones Internet Cafe is a great coffee house, with wonderful breakfast and sandwiches. There is some limited spots to park, but it is very worth your time. There are reviews that label it as the “best breakfast in town.” Even if you aren’t a coffee drinker, they have a great variety of non-coffee drinks. This gives you the amazing coffee house feel. Places to sit down, pull out your lap top and get some extra work done, check emails, or scroll Facebook. They do breakfast and lunch deals, and specials, just like any other place. It’s a great, easy, and quick place to get some work done, take a quick break from a trip or have a sit down with friends. 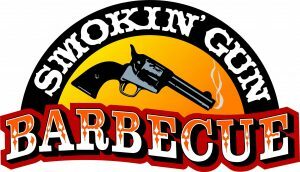 If you are feeling very ambitious on your trip, the must-go place is Smokin’ Gun BBQ. This is a ways off from the Freeway, but if you have the time, it is a great place to stop and eat. A wonderful barbecue joint that will leave you full and happy. A great family friendly, and very cozy atmosphere. The meat is known for being so well cooked and savory, it is the highest of highs when it comes to barbecue, great prices and fresh cut fries. One of the main staples at a BBQ joint is the baked beans and these are known to be the best in the BBQ joint business here in Southeast Idaho. The service is super down to earth, friendly and it has a very quiet feel and setting. Perfect for a relaxing time and great food. These are just a few of the great places to eat in Blackfoot. 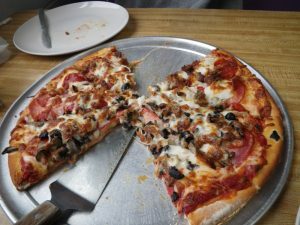 Make sure that you come and eat, give these places a try, and enjoy some of the highlights in Blackfoot, Idaho, whenever you may get the chance. Blackfoot is the perfect stopping point as you traverse from south to north, north to south on the freeway from Utah all the way to West Yellowstone.